"It's all high-wire melodrama, good-humoured fetishism and flamboyant self-mockery. We hopefully expect it to be with us for a long while." Seems we're in for a treat when this episode opens with Christopher Lee standing purposefully in the path of an oncoming car—yes, it hits him, tossing him "20 feet in the air". The disconcerted driver takes him directly to the local hospital, where this "corpse" gets up and walks away! As our avengers investigate this mysterious fellow, they come to the Neoteric Research Unit, a top-secret—surprised?—laboratory. Steed is off to meet the facility's director, who bears a remarkable resemblance to the indefatigable "victim". I confess the ensuing plot fails to capture me, with yawn-provoking dialogue...has its moments, but not a favorite for me. Note to continuity editor: It would seem our Steed cannot decide if he is wearing gray or brown today...never took him for such a quick-change artist. Libations: A glass of champagne each—this one left me thirsty, too. This episode is only worth a sorry 2 libations. As Steed greets Emma with his usual "Mrs. Peel—", she cuts him off as she replies, "Sorry, Steed, I'm needed elsewhere...."
Indeed, she is: kidnapped while hailing a taxi, Emma is whisked off to a defunct movie studio where a mad director plans to film her death. Under an eternal contract to him are 2 aging has-been actors who lead our heroine through a series of clichéd movie genres, heading toward the fait d'accompli. Fans either love or hate this prime example of The Avengers' 1967 season—a dichotomy I easily understand. It seems at some point during their first color season they finally tuned in to their audience and began to capitalize on why they came out, week after week, in numbers: the clever humor, the dubious intrigue, and, mostly, the high camp fun. There is no question one must forgive plot and suspend disbelief to truly enjoy this new brand of absurdity: judging by the show's new rise in popularity, millions did. This episode is classic tongue-in-cheek, Avengers-style fun that symbolizes a turning point. They know they are proposing preposterous plots and play them to the hilt. (Proof is in the opening, when Emma, flipping through the channels, watches a few seconds of the first season's "The Cybernauts"!) Viewed with an open mind and a smidgen of 60's TV innocence, this is a gem of a thriller that will make you laugh out loud. Note to continuity editor: In the "Western" sequence, Emma has a six-shooter, which she discards when she realizes it is only a prop gun; a moment later, by the electric fence, she seems to have it again; a moment after that, when she encounters the bobby, it's gone again. Libations: Too busy to tip up even a glass of their belovéd champers—but I was drunk with delight. 4-1/2 of 5 for this riot. This one treats us to a delightful twist from the start: Steed, out hunting, shoots down a rubber duck that bears his name, and Emma emerges from the bush to say, "You're needed." Mrs. Peel drives Steed to the airport where he is to attend a fancy dress party aboard an airplane. After take-off, he and the other six guests realize their invitations were forged, and they deduce each has been chosen because of their particular areas of expertise: a professional strong man, a big game hunter, a master swordsman, a bullfighter, a markswoman, a hand-to-hand specialist—and our Steed. They check the cockpit and discover the plane is being remotely controlled. Arriving at a deserted mansion on a mysterious island, their "host", by way of speakers, discloses that one among them is a trained "super killer" who will conquer them, one by one. Based on Agatha Christie's mystery "And Then There Were None" (aka Ten Little Indians), this version includes the same red herring to disrupt our vigil for the killer, throwing off the body count to confound both the characters and the viewing audience. There is a nodding reference to the original work when the unseen host notes, "And then there were 6..."
This delightful fantasy includes performances by Charlotte Ramping as Mrs. Hana Wilde (the markswoman) and a ruthless Donald Sutherland as the devious mastermind. This is high suspense in theatrical style, with everything done well. A superb cast, solid fight scenes and an excellent, though expected finish. Libations: Steed downs champagne and a stiff drink to steel his nerves and another bubbly at the end with Emma. A 5 glass salute from me. Extras Review: I'm told by our other Avengers' reviewer, Mark Zimmer, that A&E produced the color series first - this explains in a snap to me why the design of the black & white series is so much better. The overall package design for the color series is a disappointment, flat and muddy-colored and nowhere near as exciting. The menu is a snappier, more 3D sort of interface, but I really prefer the look & feel of the flatter, more 60's approach to the interface in the b&w series. The problems here arethe same: too many clicks to navigate the chapters, etc. The extras consist of a gallery of stills from individual episodes included on each disc - these are a bit bigger and so easier to enjoy, but I found the tabular interface confusing, and the number of images disappointing. 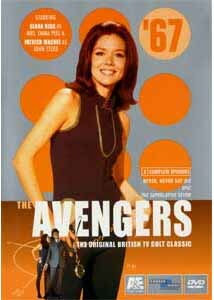 Every disc also has a menu link to A&E's "www.originalavengers.com", a good marketing move but poorly executed - why not give us a real taste of what's in store for us there? Bios, interviews, scripts—"all would be welcomed by aficionados and newcomers alike. This disc, too, is one of the best overall. If you are purchasing by the set, then this should be the first on your list. 2 great "must have" episodes make this a "superlative epic". 4-1/2 generous martinis.